(BOSTON) – Massachusetts Eye and Ear made medical history on Tuesday by performing the first post-FDA approval gene therapy for patients with a form of inherited blindness. The occasion marks the beginning of a new era in medicine, as it is the first time any FDA-approved gene therapy has been given to a patient for any inherited disease. 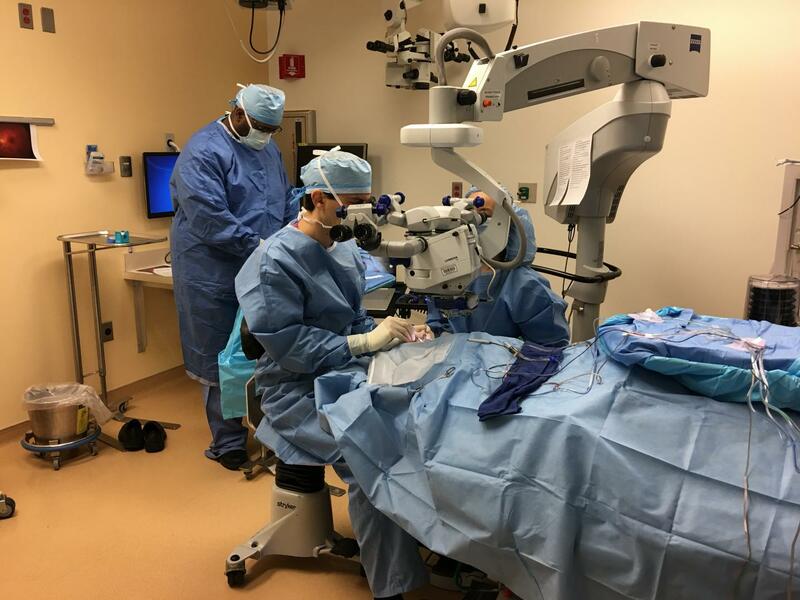 "It is an honor to be involved in this exciting procedure following FDA approval, and to play a role in allowing a 13-year-old boy an opportunity to enjoy improved vision for years to come. This project has been underway for 20 years, and the early successes with this therapy demonstrated by Jean Bennett, Al Maguire, and others, inspired me to dedicate my career toward helping patients with inherited retinal diseases" Dr. Comander said. "I am so excited the time has come when we can offer this groundbreaking therapy to our patients, who are truly in need of our help." The newly approved treatment involves injecting a modified virus into a patient's eyes to correct a deficiency caused by mutations in the RPE65 gene. These mutations prevent the production or function of a protein needed for proper functioning of the retina, the light-sensitive tissue in the back of the eye that initiates vision. Mass. Eye and Ear is one of just eight medical centers in the United States certified to perform the gene therapy, and the only site in New England. "I am proud of our team for earning the distinction of being selected as a Center of Excellence for the administration of Luxturna," said Eric Pierce, M.D., Ph.D., Director of the Inherited Retinal Disorders Service at Mass. Eye and Ear and the Chatlos Professor of Ophthalmology. "It was a natural fit because of our department's ongoing experience with developing gene and genetic therapies here in the Ocular Genomics Institute and with their testing in ongoing clinical trials." "Today we celebrate the decades of work by many individuals to bring gene therapy from science fiction to clinical reality for patients with inherited retinal disease. Gene therapy will now join the list of innovative therapies used routinely at Mass. Eye and Ear to treat patients. We are thrilled at Mass Eye and Ear to be one of the first centers to offer this life-changing therapy to patients, and proud of our long, successful history of developing translational retinal therapies," said Joan W. Miller, M.D., Chief of Ophthalmology at Mass. Eye and Ear and Mass General Hospital, and the David Glendenning Cogan Professor and Chair of Ophthalmology at Harvard Medical School. "Our hope is that our ophthalmology community can leverage Luxturna's success to accelerate the development of similar gene therapies for the many blinding retinal diseases that still afflict our patients." For more information: Patients with an inherited retinal disease (e.g. Leber congenital amaurosis or retinitis pigmentosa) whose genetic testing showed mutations in the RPE65 gene should contact Spark Therapeutics for more information about Luxturna. Patients with an inherited retinal disease without a genetic diagnosis should talk to their doctor about genetic testing, and are also welcome to make an appointment with one of the physicians on Mass. Eye and Ear's IRD service.